I have a confession. I am jealous of all you Marylanders (Marylandeans?) with your 50+ state parks. Okay, so it’s a much larger state than Delaware, but still, I’m jelly. 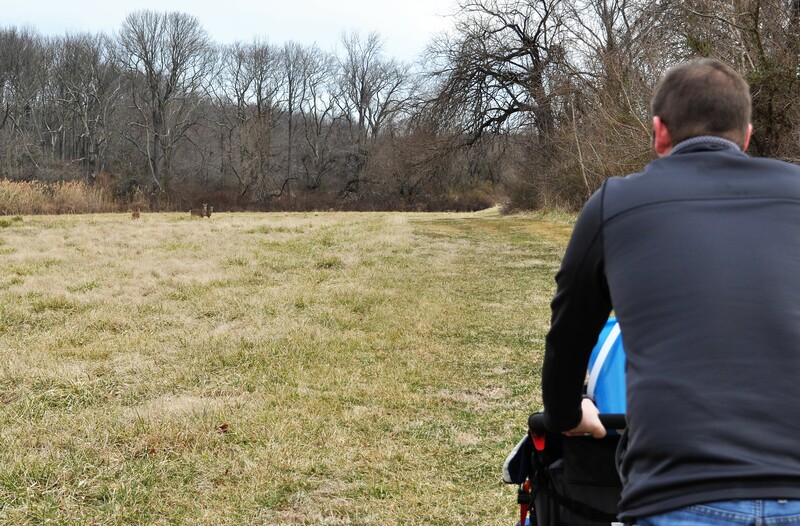 We have a long way to go before we visit every single one of Maryland’s state parks. Hopefully someday we will unlock that achievement. We have begun the challenge! Each state park is rich in history and it is actually very interesting to learn about how the individual tracts of land become state parks. 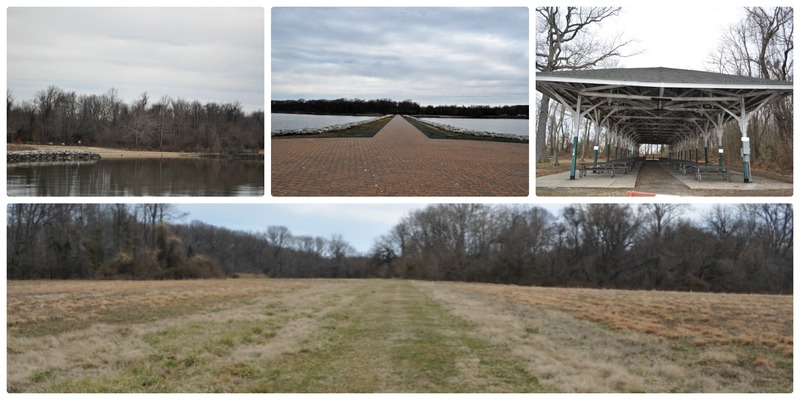 North Point State Park is the perfect example of a place with an interesting backstory. We went in to this adventure completely blind, (as usual) not really planning what trails we would hike or researching what site amenities were there prior to the visit. We drove in, found a parking spot, and began wandering around. The boys were immediately drawn to the boat ramp. There, we were fortunate to have the most gorgeous view of the bay. The water was as calm as could be so it looked like glass as far as we could see. (I rhymed!) The shore was lined with re-purposed bricks, which the boys absolutely loved because they could build towers with them. When we finally tore them away from that area, we walked all the way out to the end of the most fancy fishing pier I’d ever walked on. We met a very kind angler who entertained all of D’s questions and comments even though I’m sure he would have much rather fished in peace. We passed a small “beach” area with some sand as well as a HUGE picnic pavilion. Hubby and I both commented on how nice and unusual it was. As it turns out, it was a trolley station in its previous life. How cool is that?? The state park was home to the Bay Shore Amusement Park in the early 1900’s and was only accessible by trolley during that time. Unfortunately, the visitor’s center, modeled after the restaurant that stood there 100 years ago (and bathrooms) was closed during our visit, but there were port-a-potties dotted throughout the park for emergency purposes. We decided to follow the “hiker-biker trail” from the visitors center and were intending to make it a loop by returning on the beaver trail, but at some point along the way we ended up on a trail that wasn’t on the map. It brought us back to the parking area that we originally started at near the boat ramp. Along the way we had some really cool experiences. The first of which occurred as we were passing through the field portion of the hiker-biker trail. We were walking along, not really paying attention to our surroundings. At the time, I was trying to decide if I wanted to take my coat off. As I had one arm out of my coat, I looked up and we were in a face off with three beautiful deer. They weren’t too alarmed by our presence, just curious. We got to watch them for a little while until we decided to keep walking and they decided they didn’t like that. Almost immediately after that encounter, hubby walked off in to the woods. Of course we followed and stumbled upon an old homestead. Most of the evidence that it once was a home was gone, but the foundation remained. It was obvious that it had been in that state for quite some time judging by the size of the trees growing from what could have been the living room area of the house. 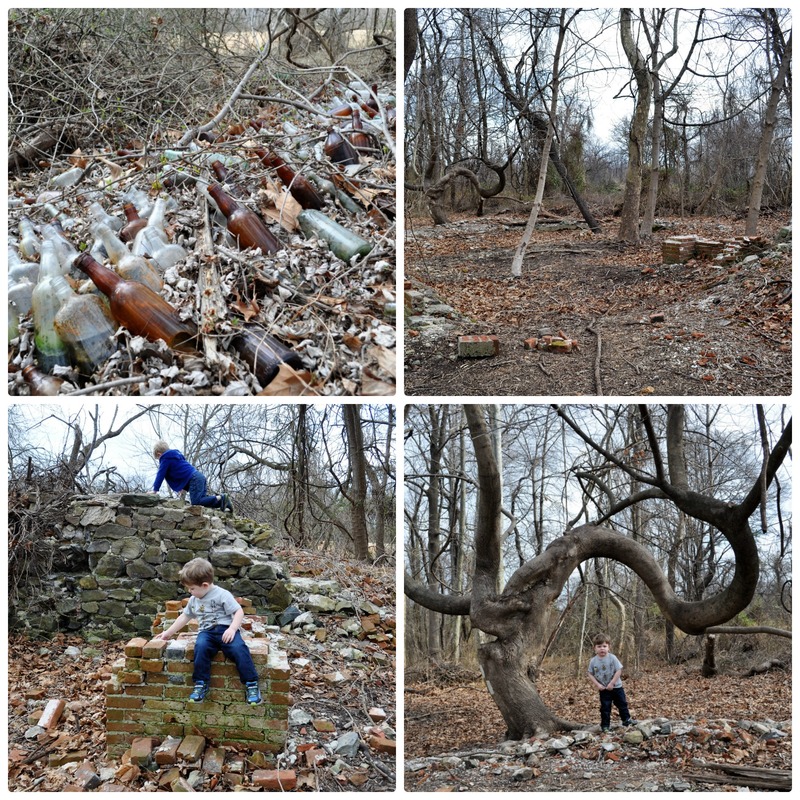 We also found a huge vintage bottle collection that was perfectly organized and seemingly untouched, as well as a beautiful stand of daffodils in the woods and a uniquely shaped tree.